Julius High Jr was born in Atlanta, GA on August 2nd 1934 and sang gospel from an early age, notably with the Ebenezer Baptist Church Choir. By the early 60s he was a member of local group the Royals singing in local venues, and made his recording debut in 1963 for Diamond records as “Little Julius”. 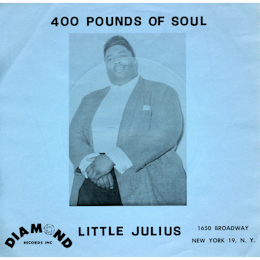 Since the label’s publicity was already billing him as “400 lbs of soul” his name on the 45 was a little odd to put it mildly. In any case “The Bachelor” is a pleasant piece of pop soul put together by Teddy Vann and cut on his home territory of the Big Apple. During the 60s Julius’ main source of income was the famous Royal Peacock Lounge in Atlanta where he worked with a large number of the soul greats when they came to town. He found time to cut sessions with that odious man Huey Meaux who issued a couple of 45s on him as Lotsa Poppa – the name we best recognise him with. 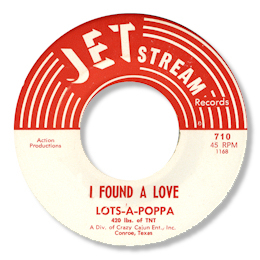 The first 45 was a two part medley of “I Found A Love” and That’s Where It’s At, even though the 45 describes them as two separate songs. Accompanied by an excellent uncreated second vocalist and a small band with wandering tenor and baritone sax, this is a real screamer of a single. The second part as each vocalist attempts to out shout the other is a feast for fans of gospel drenched music at its most fiery. His final single is a real oddball as it never received a US release, known only via a really obscure Canadian pressing. 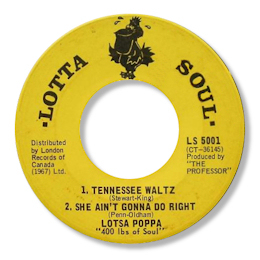 “She Ain’t Gonna Do Right” and Tennessee Waltz were actually recorded in that country via a visit in the late 60s and I’d say that it is without a doubt the best soul session ever held there. “Do Right” is a really strong uptempo version with nice horn charts and a throaty “gotta gotta” vocal from Julius. His cut of that old standby “Tennessee Waltz” is, along with the version by Little Alfred and the Boogie Kings, my favourite one. This just may Julius’ best ever vocal, and the way he and “the Professor” (lead singer of Montral band The Persuaders) trade phrases is just wonderful, and they’re helped by some lovely climbing horn riffs. Lotsa Poppa celebrated his 38th year of making music in 1998 with a celebratory concert at the Auburn Avenue Elks Club in Atlanta and retired in 2002. Sadly he has been in poor health over the last few years – but I've been in contact with his brother George High Sr (via Poppa's own website which you can find here)who says that thankfully "his mind is very sharp and he remember most everyone that he has ever known and he gets visits often and when the entertainers are in town they stop by and visit him and he remembers where they played and even their names." UPDATE ~ JT Thompson who worked with Poppa in Atlanta has written with the desperately sad news that Poppa passed away on July 14, 2014, he was 74. You can details of his memorial service on his website here. And sign his guestbook here. A fine singer and wonderful human being - his talents will be sorely missed. JT's revelation that Poppa also recorded as Lukas Lollipop came to me too late to ask Poppa about it - another shame. Special thanks to my friends Yass for tracks and to Kevin Kiley for the suggestion.